Writing Updates, Upcoming Events, and my Origins Schedule! 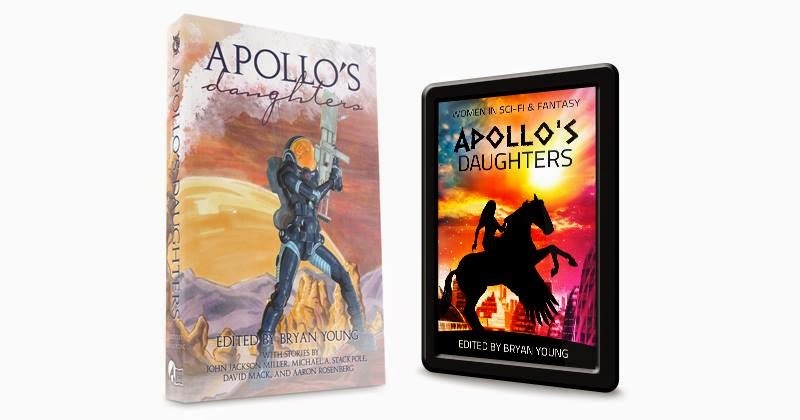 So, the first and biggest thing I'd like to tell you about is the signing for Apollo's Daughters that is happening in Salt Lake City this weekend. If you're anywhere nearby, I'd love to see you come out for it. Apollo's Daughters, and it's companion anthology Athena's Daughters, strives to highlight the female protagonist in a collection of short speculative fiction, Apollo's Daughters being written by male authors. Signing and meet and greet begins at 6pm, with readings from Bryan and Jason Young beginning at 6:30pm. Both authors and artists will be available until 8:00pm. You may purchase Apollo's Daughters at Eborn Books day of or snag it on Amazon now. It's incredibly important that you come out to readings and signings that authors do at bookstores. Not just me, but any writer. Bookstores will do just about anything with an author once, but if there's no turn out, they won't be doing much more with that author. I'm a guest again this year at Origins Game Fair, held annually in Columbus, Ohio. I'll be on a number of writing panels and my schedule is posted below. I'll be spending all the rest of my available time manning a table where I'll be selling and signing books. I hope to see you there. I attended CONduit over the weekend and had a lot of fun. At my reading, I read the story Escape Vector which is a part of the upcoming anthology from Silence in the Library called Contact Light. I think the story works really well when read aloud and it's probably what I'll be reading at Origins for my "Story Hour." CONduit was a great time as well. I talked a lot of Star Wars and got to be on panels with a lot of friends, old and new. Though I took a couple of days off of writing over the weekend to spend some time with my son for his birthday, I got back to work this morning and cranked out a thousand words on a new short story and the first draft of the new fantasy novel. I think I'll be finishing that short story tomorrow and start a new one, both of them aimed at my collection of science fiction short stories. I've been toiling away on a couple of freelance columns and stories as well that I hope will be shared with you sooner rather than later. As for new published writing, I wrote a piece for StarWars.Com about the cinema influence of Busby Berkeley on the Star Wars universe. You can read that here.